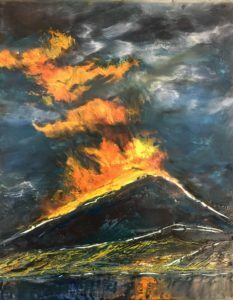 It’s the holiday season and last month I received a commission gift request, to paint Mt Etna erupting! The couple met while studying abroad at the University of Catania in Sicily. 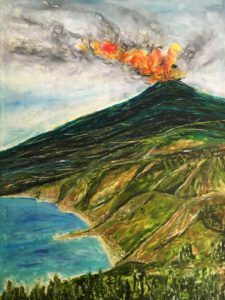 I have never been to Sicily, but have been to Italy several times, and had to relate to the landscape of this Italian island without a first hand visual experience. 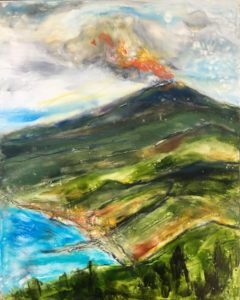 I sketched a composition capturing the shoreline, the rough terrain, along with the active volcano. I had to combine several of their photographs to create this custom landscape. By sketching different versions of the landscape I could get familiar with the lay of the land, and I was able to flow right into the larger final version. It will take several weeks for the oil sticks to dry completely before the painting can be shipped. I may end up making a few minor adjustments, adding touches of color using pan pastels or oil pastels, time will tell. I rarely accept commission requests, it causes me great amounts of anxiety! I always tell myself worst case scenario, the client hates the painting and doesn’t have to take it. Sharing the development of the painting via emails and text images has alleviated much of the anxiety but still, it is always my top priority to make sure clients fall in love with their painting. When that happens, it is a perfect match.